11.5 x 9.75" x 1"
Amate or bark paper was made by the Mayans as early as 200 AD by a process similar to the one I used to prepare this wall hanging. Cooked inner bark strips of the paper mulberry (kozo) were interwoven and beaten on a wooden board to fuse the fibers into a continuous sheet. 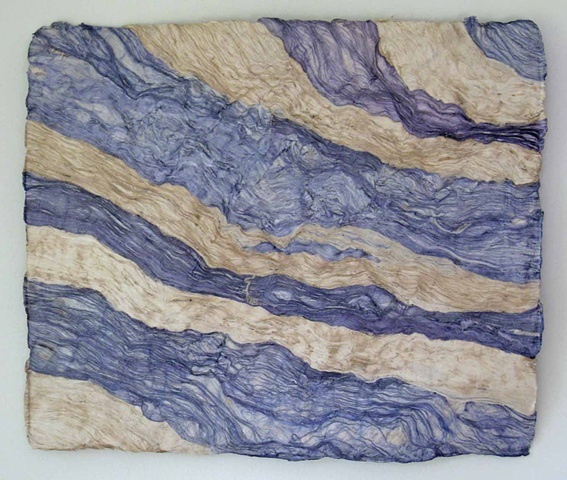 Some of the fibers were dyed prior to beating. The smooth surface of this piece is the side of the bark paper that was lying against the board on which it was made. The opposite side, beaten directly with the stone, is rough. The completed amate piece was sewn to a wooden support that allows the artwork to be readily hung in any orientation.